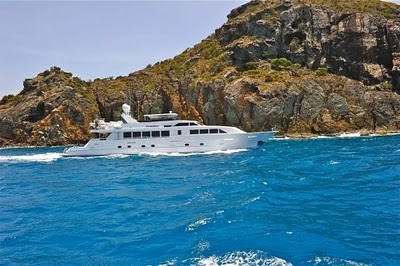 After a Major Refit in 2010, Luxury Yacht Freedom is Available for Charter in the Virgin Islands. Whether at the end of a full day of sunning, diving, kayaking or just relaxing, entering your spacious stateroom is a retreat all unto itself. Exquisite designer fabrics lure you into the custom-made bedding and comfy pillows. Well-crafted oak cabinetry and beautifully lit interior walls create a warm and inviting ambiance. Motor yacht Freedom offers an impressive, full-width master stateroom with a king-size bed and en suite his and her bathrooms. Separating the two sides is a large glassed-in marble shower. Easily drawn curtains offer even more privacy. There are plenty of cabinets, drawers and closet space for all your personal belongings plus a full-size desk area. Forward along the extra wide passage way are three more staterooms. Two offer queen-size beds with plenty of walk around space and their own en suite bathrooms and shower. One stateroom is perfect for kids with twin beds and a pullman for a younger child. It also has its own bathroom and shower. Not yet ready for slumber? Then watch your favorite TV show or movie on your HD flat screen TV/DVD with a dedicated satellite receiver. Connect with friends or update your Facebook through our high-speed internet Wi-Fi. Or plug in your iPod and lie back as you listen to your own music selections or podcasts. Unwind even more by stepping into your spa-like bathroom with its modern vanity and full-size shower. Finally, wrap yourself in one of our luxuriously thick cotton robes. Everything you need is right here. And anything you desire is well within reach.